With GST being thoroughly implemented by the Govt. there are certain issues which are still being faced by certain taxpayers all over India. The first and foremost of those hurdles are that of invoicing under the GST regime. Through this article, we have tried to put together a summary of all the invoicing rules and provisions into one thread and help everyone in implementing GST invoicing into their accounting systems. We have tried to encapsulate the most crucial points which need to be fixed in mind at the time of invoicing or preparing other documentation such as vouchers etc. by businessmen. Further, to comprehend those provisions we have prepared a certain set of questions which are concerning a businessmen mind and are answered in a most easy way to be understood. (a) What the GST Law says? shall issue a consolidated tax invoice for such supplies at the close of each day in respect of all such supplies. When and who has to issue a Bill of Supply? As per Section 31(3)(d) of CGST Act, 2017, a registered person shall, on receipt of advance payment with respect to any supply of goods or services or both, issue a receipt voucher or any other document, containing such particulars as may be prescribed, evidencing receipt of such payment. As per Section 31(3)(e) of CGST Act, 2017, where, on receipt of advance payment with respect to any supply of goods or services or both the registered person issues a receipt voucher, but subsequently no supply is made and no tax invoice is issued in pursuance thereof, the said registered person may issue to the person who had made the payment, a refund voucher against such payment. When to be made and who has to make it? *Registered taxable person issuing Debit / Credit notes to declare its details in the return for the month during which such notes are issued / received or in the return for any subsequent month but not later than September following the end of FY of supply, or the date of filing of the relevant annual return, whichever is earlier, and the tax liability shall be adjusted in the manner specified in this Act. The delivery challan must be prepared in triplicate? Question 1: What are the different types of invoices to be raised under the GST regime? Question 2: Is mentioning of PAN compulsory in the GST invoices? Ans: W.e.f 1st January, 2016, quoting of PAN is compulsory for sale or purchase, by any person, of goods or services of any nature exceeding Rs. 2 lacs. Though this is a provision of Income Tax, we still believe that this requirement should be taken care of while issuing invoices. Question 3: What are the maximum no of characters that are allowed in serial no. of invoices? Question 4: When do I need to mention the name and address of the unregistered person in the invoices? Ans: When the value of supply is above Rs. 50,000. However, the recipient can also request for mentioning the details even when the invoice is of less than fifty thousand rupees. Question 5: When is Tax invoice issued in case of supply of goods? Question 6: When is Tax invoice issued in case of supply of services? Question 7: When is Tax invoice issued in case of continuous supply of goods? Ans: In case of continuous supply of goods where successive statements of accounts/ payments are involved, invoice shall be issued before or at the time of each such statements/ payments. Question 8: How is invoicing done in case of sale on approval basis? Ans: In such cases, as per sec. 31(7) tax invoice need not be raised at the time of removal. This is because the removal cannot be said to be made for the purpose of supply to the recipient, as it is not certain (at the time of dispatch of goods) that the sending of goods will result in a supply. However, on or before the confirmation of the supply by the other party, the tax invoice has to be issued. The law provides a time limit of 6 months from the date of removal, during which the goods will not be treated as supplied. Where no confirmation is received within such period, a tax invoice should be issued on the day immediately succeeding the 6-month period. Question 9: When an invoice is issued under a reverse charge? Ans: When the tax liability is on the recipient for the reason that the supplier of goods or services is an unregistered person, the recipient will be required to issue an invoice in respect of such goods or services. This concept is known as Self-invoicing. Question 10: When such self-invoice has to be issued under reverse charge? Question 11: When is a payment voucher to be generated under reverse charge? Ans: As per Section 31(3)(g) of CGST Act, 2017, a registered person who is liable to pay tax under reverse charge has to issue payment voucher at the time of making payment to the supplier. Question 12: How is invoicing done in case of supply to unregistered person? Ans: When an individual supply is less than Rs. 200, the supplier shall issue a consolidated tax invoice for such supplies at the close of each day in respect of all such supplies. Question 13: Can an unregistered person issue a tax invoice? Ans: No, an unregistered person cannot collect taxes and hence cannot issue a tax invoice. He/she will need to issue a ‘Bill of supply’. Question 14: What will happen in case an advance is received against supply of goods or services? Ans: A registered person shall, on receipt of advance payment with respect to any supply of goods or services or both, issue a receipt voucher or any other document, containing such particulars as may be prescribed, evidencing receipt of such payment. Question 15: What will happen in case an advance is received against supply of goods or services and rate of tax is not determinable? Question 16: What will happen in case an advance is received against supply of goods or services and nature of supply is not determinable? Ans: The nature of supply to be mentioned is inter-state supply. Question 17: When is refund voucher to be issued? Question 18: When is a revised invoice issued? Ans: When, a person becomes liable for registration, obtains registration within 30 days of him becoming liable for registration, the effective date of registration would be his becoming liable for registration and not the date of grant of registration. The invoices issued between the period of effective date of registration and grant of registration will have to be revised and revised invoices will be issued for collecting taxes against such invoices. Question 19: Can a consolidated revised invoice be issued to every recipient for supplies made during the period before registration is granted? b) Inter-state supplies to unregistered persons where the taxable value of the supply exceeds Rs. 250,000. 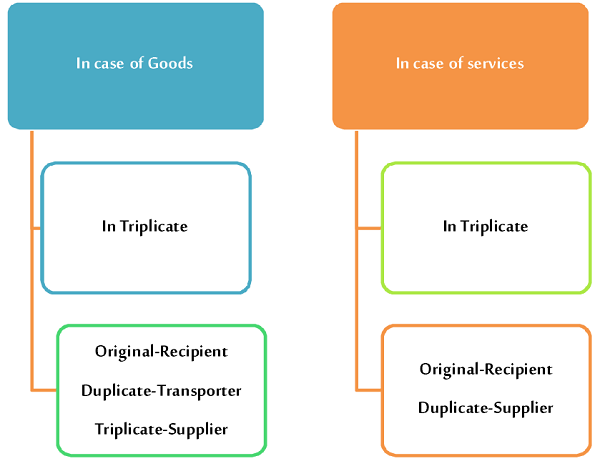 A consolidated invoice can be issued to an unregistered recipient (State-wise consolidation) not covered above. Question 20: How is invoicing done in case of continuous supply of services? Question 21: Are credit notes required to be reported in monthly returns? Question 22: Are debit notes required to be reported in monthly returns? Question 23: Can a composition scheme dealer issue tax invoices? Ans: Since, a composition scheme dealer is not allowed to collect taxes, they cannot issue Tax invoices. They can only issue a bill of supply. Question 24: Does the composition scheme dealers require to mention their nature of registration on bill of supply? Ans: They need to mention prominently the following words: “Composition scheme dealer, not eligible to collect taxes”. Question 25: Is an Input Service Distributor required to raise tax invoices, though no taxable supplies are made by him? Ans: Yes. An Input Service Distributor (ISD) should issue a tax invoice being an ISD invoice for distributing credits to the GST registrations that have the same PAN as that of the ISD. Disclaimer: The contents of this document are solely for informational purpose. While due care has been taken in preparing the above article, possibility of any errors and omissions cannot be ruled out. Moreover, the views expressed herein above are solely author’s personal views. No part of it should be copied or reproduced without written or express permission of the Author. RULE 46(p) SAYS “WHETHER THE TAX IS PAYABLE ON REVERSE CHARGE BASIS” IS TO MENTION ON TAX INVOICE. CLARIFY IN DETAIL WHAT DOES IT MEANS?when I am a registered person and issuing tax invoice and charging there cgst/sgst/utgst/igst as the case may be then where is the question of reverse charge applicability arise on my buyer. Very informative report on invoicing. Thank you! This information provides me a depth knowledge about invoicing thank you very much, Sir. 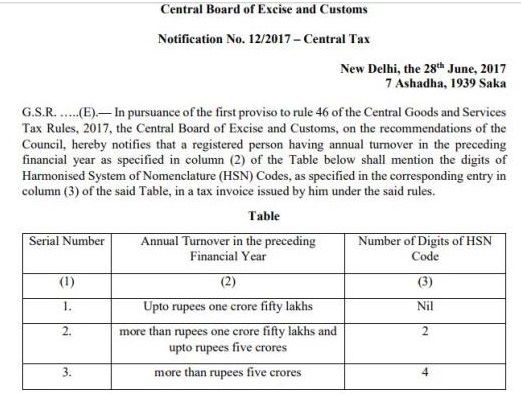 Question :- whether GST under reverse charge shall paid be by us in July ? because as per section 12(1) of CGST ACT , the liability to pay tax on goods shall arise at the time of supply and the time of supply at the time of advance payment as per clause (b) of sub section (3) of section 12 ? if we pay advance payment by bank (say Rs one lakh ) to a unregistered supplier of taxable goods on 18th July 2017 and goods shall be supplied by suppliers in August 2017 which shall be received by us in August 2017 , whether GST under reverse charge shall be by us in July or August ? Liability to pay GST will arise in July i.e. at the time of payment of Advance. Due date for payment of GST is 20 days from the end of the month.